Born Lucky Games and Klabater have announced – and subsequently released – Roarr! The Adventures of Rampage Rex on Switch. It’s out now through the eShop. Roarr! The Adventures of Rampage Rex is a brawler with “sharp graphics, fast combos and a lot of deadly battles and vicious enemies.” We have an official overview below, along with a trailer. When the aliens arrived, they didn’t come in peace. The invasion was immediate and so overwhelming that humans didn’t stand a chance. One thing it wasn’t though, was quiet… A terrible rumble from upstairs woke Rex up from her slumber. For millennia she was hibernating in his Cozy Cave but the incessant crescendo of the alien invasion was too much to sleep through. It was time for Rex to go upstairs and give her new neighbors a piece of his mind! Roarr!’s fast and dynamic gameplay is a modern tribute to the good old brawler games we all enjoyed (or heard about from the older brother!) on classic Nintendo platforms. With a load of terrifying bosses, twenty five types of enemies and six completely different Isles to explore, Roarr! is a brawler heaven (or hell!) for any gamer with appetite for destruction! Not to mention that it’s a perfect game for any wild gaming party up to four players on the coach! – Countless combos, swarms of enemies, 6 towering bosses and one very angry dinosaur! 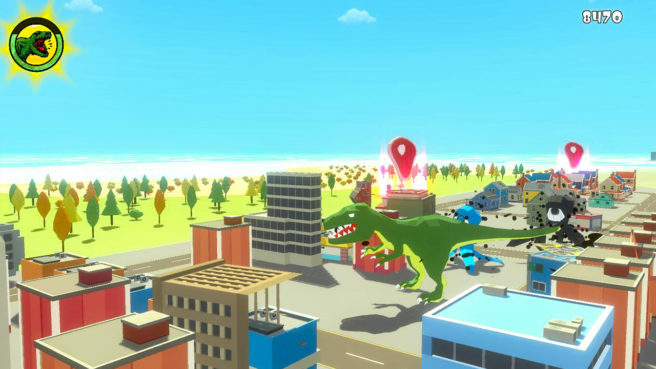 – Fully destructible environment that will let you unleash your jurassic power… Roarr!